German Potato Salad; it’s twins! As children we are influenced by what our parents like and dislike. I remember my mother carefully peeling a perfectly ripe tomato that a neighbor had given her. She sliced it, put a slice on her plate and added salt, pepper, sugar, and bottled French Dressing. She looked at me, watching her, and explained that as a child she had not liked tomatoes but she had ‘learned’ to like them. I maintained that she still did not like them. Because of that I didn’t eat tomatoes until I was a teenager at which time I rebelled against what I had been taught, as teenagers do, and started eating tomatoes. German Potato Salad, on the other hand, she didn’t even pretend to like. I was warned against it whenever it appeared at the family reunion picnics we attended in the park every summer. I never touched it…. 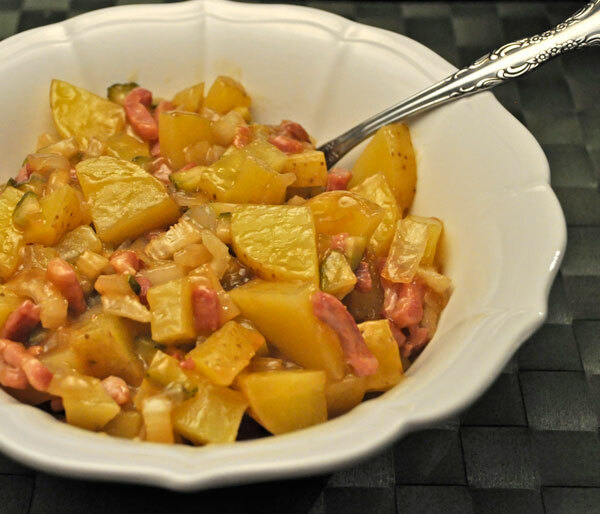 Until I was older and cooking on my own at which time I decided that potatoes with bacon and pickles had to be good. Unlike the Summer Salad that I posted a few weeks ago, (which is normally served at room temperature) this one is traditionally served hot. This serves 4 (or 2 people twice). Slice potatoes – the long way, first in half, then in half again. Now slice (the short way) about 1/4 inch thick. We are aiming for bite size so if you have a huge potato, adjust accordingly. Put in a steamer basket over an inch of water and steam over medium heat for 15 minutes or until done. Sauté bacon in oil in medium skillet. When done remove and set on paper towels to drain. Remove all but 1 tbs oil from pan. 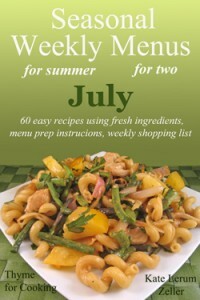 Add onions, celery to pan and sauté until tender, 10 – 15 minutes. Add sugar, stock and vinegar, stirring and scraping up any brown bits on bottom of pan. Dissolve cornstarch in stock and add to pan stirring constantly to thicken. Add pickles, potatoes and stir gently to combine. Crumble bacon and add to potatoes. Stir to mix and serve. I have another bad photo for you…. I’ve mentioned in the past that, here in France, and likely all of Europe, cows, bulls and calves are all kept together in the same herd. Our farmer neighbor keeps the herd in barns over the winter months when it’s cold and rainy. Apparently there is a bit of partying going on in the barns as, shortly after they are left out into the pastures in the spring, calves start appearing. Over the course of the summer we regularly notice one or two or three new tiny calves every week or so. 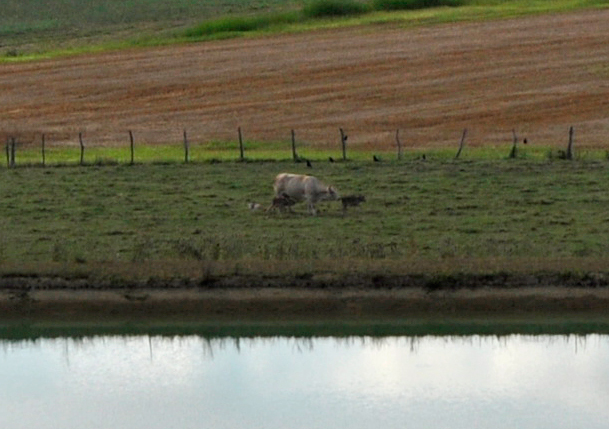 Last week there was a cow lying in the filed just across the pond. It looked like there was a very tiny calf by her. There were two tiny calves by her. You can see one eating and the other is by her head. Shortly after I attempted to take photos they all lay down again. I’m guessing she had just given birth. They stayed there for the rest of the day and evening, not going off with the rest of the herd as the cows usually do. The next morning they had joined the herd and the new babies were running around with the older calves. Life in the country can be so entertaining…. Actually I’m with you 100%. LOVE the twins story. We watch that kind of thing with total fascination. AND tomatoes! AND bacon with just about anything is over the top with me. Yes, tomato & bacon & potato & pickles! Hmmm…. I must have seen it somewhere, and, loving pickles, decided it was a great idea. IMO i was right!